Pettit’s Pastry has always been my family’s go to for donuts in Omaha. However, I haven’t tried every donut shop in Omaha (#lifegoals), so I can’t say they’re the best donuts in Omaha. But, I’ve done something far better for my waistline: Polled Facebook. I asked about 10,000 Oh My! Omaha followers* to share their favorites and we have a pretty clear consensus of favorites, plus a ton of highly recommended runners-up. It turns out Pettit’s isn’t the No. 1 donut shop in Omaha for everyone, but it’s ranked up there. I have two I have to visit now to compare. 1. Olsen’s Bake Shop ran away with the votes, beating out No. 2 by more than double the votes. It’s family-run and a bit old school, and if you’re dying for a kolach, you can find it here. You’ll find this gem off-the-beaten path a few blocks south of the Old Market at 1708 S. 10th St.
2. Bob’s Donuts is new in town, but already a favorite for many. Think artisan donuts that are darn Instagrammable. Find it in the trendy neighborhood, Blackstone District at 3824 Farnam St., Suite 122. Incidentally, you can also get chicken here. 3. Pettit’s Pastry, my old-school favorite, came in third. The family-owned business has been open since 1954. It also happens to be pretty conveniently located near the route of a lot of parades, making it a great go-to stop before or after parades like the Septemberfest Parade. 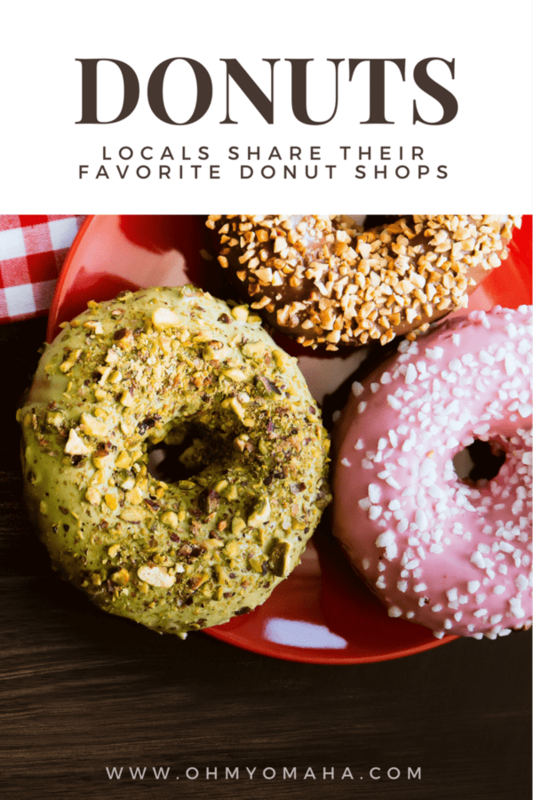 The original, downtown spot, is at 502 N. 16th St., and you can find a second location in West Omaha at 12039 Blondo St.
– The freshly-made apple cider donuts at Ditmars Orchard & Vineyard in Council Bluffs, Iowa, is just about my favorite thing of fall. You can find six packs of the donuts in local grocery stores but they can’t compare to tasting one while it’s still warm at the orchard. Ditmars is at 19475 225th St., Council Bluffs, Iowa. Learn more about the orchard here. 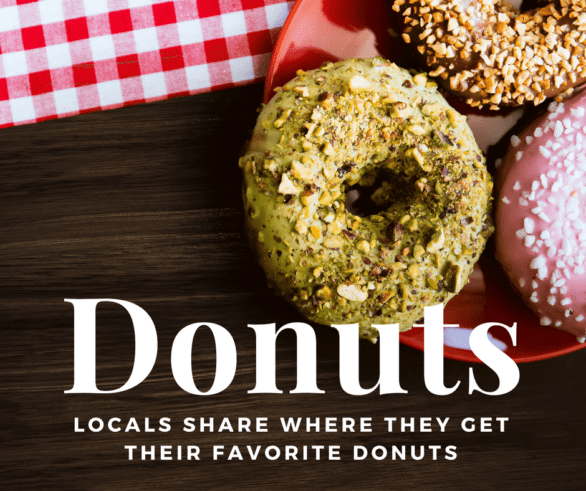 – A surprise donut favorite is Harold’s Koffee House. I’d first heard about this Florence restaurant from a reader who suggested it be included in the best places to get breakfast in Omaha list. She specifically mentioned the donut. So I had to go and try it myself. The homemade donut was so good, I can’t remember what else I had ordered. Head to North Omaha for this diner at 8327 N. 30th St.
Sweet Magnolias Bake Shop, 813 N. 40th St. The Uptown Bakery, 2229 Thurston Circle, Bellevue, Neb. Donut Haven, 13807 P St.
Gerda’s German Restaurant & Bakery, 5180 Leavenworth St.
Jones Bros. Cupcakes, 2121 S. 67th St., 2615 S. 180th St., and inside Westroads Mall. Looking for cronuts? Jones Bros. apparently makes them. And some franchises that got some recommendations include: Winchell’s, LaMar’s and Donut Professor. I should also point out, if you’re feeling incredibly indulgent, you can have a glazed donut grilled cheese sandwich at Tom + Chee. Sorry, Winchell’s Tom + Chee has closed. * To see the original post requesting favorites, visit Oh My! Omaha’s Facebook page. The list was narrowed down by poll in the Facebook Group Things To Do In Omaha & Beyond (request to join here). Got a favorite to add? Leave a comment about it! Subscribe to the FREE twice a month(ish) e-newsletter sharing what’s new in Omaha, giveaways, family travel ideas, and more! Subscribe here. Thank you for this article Kim! I heart the donut!